Available for hire to design and paint original artwork on preexisting surfaces. My approach to murals is informed by a formal illustration & design education from VCU's renowned School of the Arts, as well as 9 years of mural painting experience. Dedication to a professional, thorough design and painting process gives my work quality and durability. Expect murals that are 100% custom to your space, take advantage of existing architecture, tell a story, teach something new, and last for years. My life and art practice center around the belief that you should embrace your space, and I aim to provide the creative facilitation you need to do just that. Each project is a unique adventure that deserves to be treated as such. Emily is an amazingly talented and creative young lady. We have two of her murals and love both of them. Because we had no idea what we wanted, she gave us suggestions and sketches. We are thrilled with her creations. Emily was a delight to work with. I provided some direction of what we wanted in the mural, and she contributed her own ideas, as well. Once she had a clear understanding of our design, she turned our vision into a reality. The result exceeded my expectations. I would highly recommend Emily to anyone. She is capable, reliable, and professional. The result of Ms Herr's mural transformed the room. We had seen some of her paintings at two friends' houses. When it came time to repaint a small room we asked her to give us ideas and a quote for one wall. 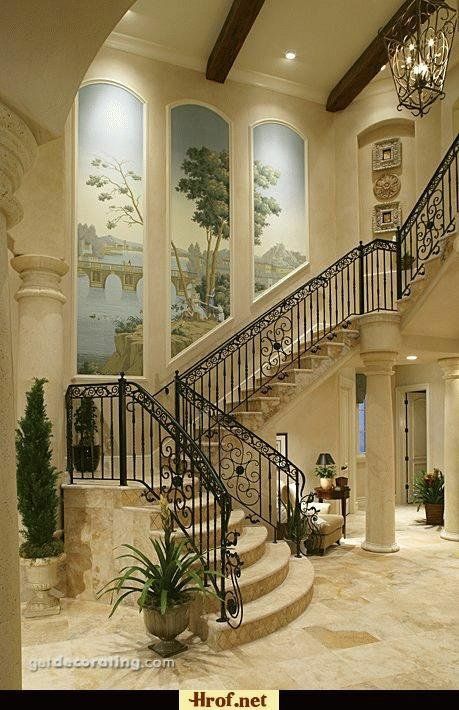 After viewing the room and the wall she sketched some ideas in full color and in the context of the room. What we liked is that they varied widely from sharp vibrant scenes to a low-contrast mandala encompassing the whole wall. We chose the mandala. On a white background, the mandala itself is the same color as the other walls of the room. The room is quite small; it was probably the nursery in 1910 when the house was built. Since then it has been both a library and an office. Painted on one of the longer walls the mandala “pushed” the wall out making the room look much larger. Simple as it is, it transformed the room. 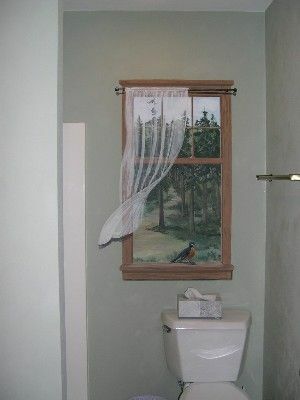 Emily Herr has painted two murals in our home: one in our bathroom, and one in our "great room." They are both highly imaginative and beautiful. She was quite open to collaboration in coming up with the designs, and worked with us easily and readily to create murals that are unique, speak to us, and that will endure. I would highly recommend her as an artist, a technician, and a lovely human being. We hope to hire her again in the future to paint yet another mural when we are ready. 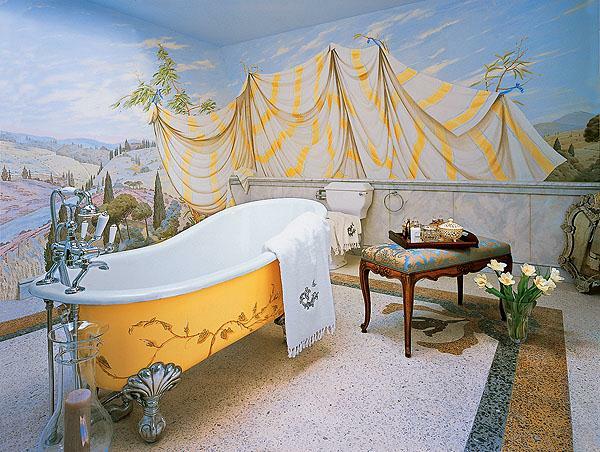 I had been looking around to see how to turn a drab, tiny interior bath into something more interesting. I had seen Emily’s murals at another friends house and it was just the right idea. Not being creative, the only suggestion I gave her was that it would be nice to have animals looking in a window. The design Emily created was perfect- the details in the scenes are more than I ever dreamed—every time I go in there I enjoy the friends who look out on me. I have had the pleasure of working with Emily Herr. She is very versatile, accomplished and does great work! She is very friendly and personable, and with a mind for the details and the right artistic touch for any project she is working on. I would highly recommend her. FREE INITIAL MEETING: Free! I start with an on-site visit where we discuss your idea, budget, and timeline, and I offer a preliminary price range and sample contract for you to review. If you would like to proceed to the next step I ask a $200 flat rate for concept sketches, which serves as a non-refundable deposit and retainer. CONCEPT SKETCHES: Once I’m picking up what you’re putting down, I’ll hunker down in the studio and whip up a few concept sketches. These are approximations of size, content, color, and complexity that reflect various points within the preliminary price range. Each one will have an estimate attached, in order to help you decide which will best fit both your budget and plans. CONTRACT MEETING: We'll get together again, review the sketches, discuss which suits you and your space the best, and review the contract. Once you select a sketch and we agree on a price, we'll sign the contract. 1/2 of the price is due up front. WALL-PREP + PAINTING: This is the meat of the job, and the most fun part! I paint, you watch your mural blossom before your eyes, and we both document the process like new parents. FINAL DOCUMENTATION + INVOICE + HIGH-FIVES ALL AROUND: Once everything is finished and cleaned up and the last picture is taken, the balance of the contracted price is due. Note: For small jobs, this process may be slimmed down for the sake of efficiency and sanity. Not all murals are created equal. I work with each client to paint a completely unique product that is customized to their space and budget. That means figuring in a lot of different variables, and unfortunately makes it impossible to give you a hard and fast price. The time any project takes depends on its size, complexity, and environment. Factors like wall surface type, number of colors, geometric shapes or typography, and flat or modeled shapes play a big role here. The question "How much does it cost to paint [X]?" can have answers ranging from $500 to $5,000 to $15,000. For some eclectic examples of the wide range of mural possibilities in the world, and maybe to get some more ideas for your space, check out these boards on my pinterest. How long does it take to paint a mural? Anywhere from a day to a month: see 'How Much?' above. I do as much planning as possible so that I can work quickly and efficiently once I'm on the wall, so the design + planning time is usually much longer than the actual painting time. 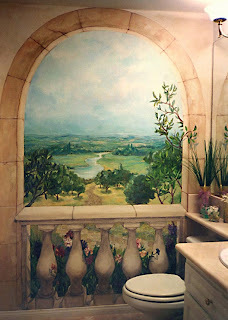 Can you paint Shrek / this art I found on google images / an Italian garden through my bathroom wall / fake wood or marble? Sorry, you're in the wrong department. My list of outright "no"s is short but firm: no faux finishing, no classical trompe l'oeil, and no third party copyrighted work. I live in Washington, DC / Washington state / Australia - do you work outside of the Richmond area? Absolutely! I love to travel and am currently seeking opportunties to paint in far off lands, so I'm more than happy to visit you. For on-site preliminary consultations outside a 1 hour drive from downtown Richmond, VA, gas is on you. How long does a mural last? Interior: Deep into the misty veil of time unknown, as long as it's out of reach of direct sunlight and toddlers. Exterior: I use a clear top coat that protects the pigment in the paint from fading and breaking down, so I usually estimate 10-15 years with no fading or peeling (based on guarantee provided by most paint companies.) This may change depending on the surface (pre-painted, raw brick, treated wood, etc. ), type of paint, and location. Durability is always a top priority for me in the planning process, and I do everything I can to properly prepare, paint, and seal your wall for maximum longevity. How do I clean it? Can I wash it? What if it gets damaged? I paint with acrylic and latex paints (usually) and seal them with a clear top coat, so when everything's said and done you can wash them like you would a normal wall - if you are one to wash walls. If your mural has been damaged in any way, I offer touch-up and repair services at a discount to past clients. Do I have to know exactly what I want when I call you? Nope. If you just a have a loose idea, I'm happy to work with you to develop it. If you have everything worked out to a T, that works just as well. Do I have to have my space prepared for you to paint? Not necessarily. I am willing and able to do most required wall prep for your space, but in cases where the existing wall is in disrepair it can be preferable to have the construction professionals come through first. Sometimes! I often call on some friendsistants for extra-large work. All responsibility for HerrSuite work, creative and otherwise, rests with me. I will seek your permission before inviting anyone else onto your private property. Yes - 1/2 of the estimate is due at contract-signing (see 'How?' above). For particularly small or quick projects, I may require full payment up-front.